Tonight I am missing something I do not know. I do not know what I am missing and yet I'm missing it. I know I’m missing something and that something I cannot grasp. I feel the unknown clutch of an unknown hand pressed against my throat. And I’m searching myself to discover what it is I'm without. Also to whom the hand belongs. But that I don’t know either. And yet, the missing isn’t really a missing at all. The something has created a void. And the missing fills it. Maybe that’s the greatest paradox of all. There’s nothing missing in me because there’s nothing to be missed. These Grey Sea Salt Caramel Brioche Doughnuts have been on rotation for the last few weeks. If you follow me on Instagram, you would’ve seen the evidence, the spills, and spatters. I wanted them desperately for the blog. Because they’re good. Not just good, better than good. 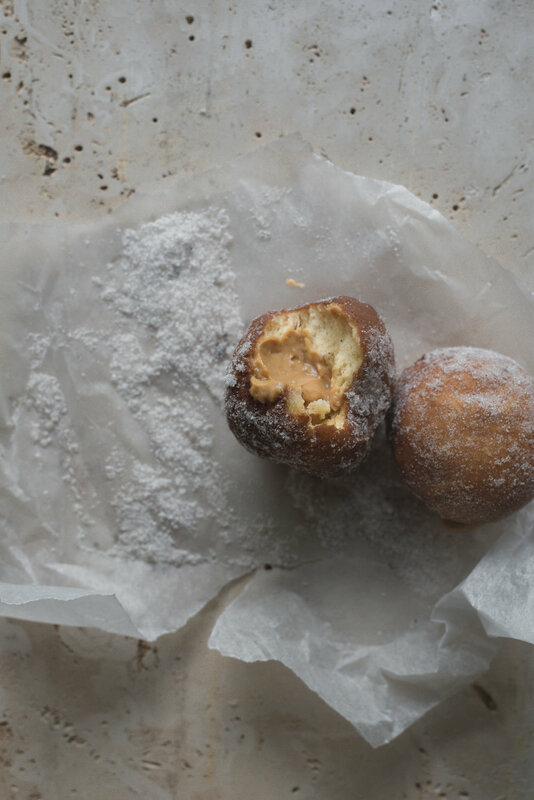 They’re great doughnuts; with the most aerated, soft, and pillowed brioche interior, and an ultra-dulcet grey sea salt caramel crème patissiere filling. The greyness of the salt provides a brinier, volcanic, and better-riff on a traditional salted caramel. The salt is from my good friend, Grace, sent all the way from Los Angeles to Australia in the best care package I could ever hope to receive; filled with salts, sugars, and stellar oats from the launch of her new company, Mylk Labs. Not sponsored, I just love her. Here’s to great doughnuts and even greater friends. This recipe requires a few time-crucial processes. To make it easier, you can begin the crème patissiere the day before and let it chill in the refrigerator overnight until completely cool before folding in the whipped cream. The brioche dough too can also be started the day before. After its first rise, simply re-cover the dough and place it in the refrigerator to chill overnight until the day of making. I used Icelandic grey sea salt sent my good friend, Grace, in this recipe. It adds an additional level of flavor complexity, brininess, and depth than usual salt. If you can't source it, you could use regular salt for a true salted caramel, or even use fleur de sel, for something a little more exotic. Pink salt or smoked salt would also work wonders. This recipe will yield about 15-17 doughnuts using a 6-cm (2.4-inch) circular doughnut cutter. You could use a smaller cutter for doughnut holes, which would require slightly less in frying time. I would not recommend using a larger-sized cutter. The doughnuts when cut out need a second proof of 20 minutes. Make sure that they do not exceed this time. You don't want them over-proofed and you definitely don't want them under-proofed. 20 minutes is a good amount of time. Also make sure that you begin to slowly bring the frying oil to temperature as soon as the doughnuts have been cut out and left to rest. A well-proofed doughnut when fried will have a ‘tan line’ running through its middle. When frying, you want to make sure that the oil sits consistently around 180 - 190 c (350 - 375 f). Make sure to adjust the stove heat as necessary to ensure this, even if it means removing the pot of oil from the heat to cool off before frying again. You can use a deep-fryer for this recipe too. I don’t own one so I didn’t leave instructions for it. If you are using one, follow the steps as specified and make sure to keep the oil at the temperature specified. Begin by caramelizing the sugar. Place three quarters of the sugar into a large-sized saucepan set over medium-low heat. Heat, swirling the pan occasionally but not stirring, until the sugar has evenly turned a deep amber color, about 8 to 10 minutes. Meanwhile, place the remaining quarter of the sugar, egg yolks, and cornstarch, into the bowl of a stand mixer fitted with the whisk attachment. Whisk, on medium-high speed, until the mixture is thick, pale, and almost doubled in volume, about 3 minutes. Next, put the milk and vanilla bean seeds into a medium sized saucepan set over medium-low heat. Bring the milk to a light simmer. Once the sugar has caramelised, pour it into the warm milk. Be careful, it will rise and sputter but will subside as soon as it acclimatizes. Whisk gently until the sugar and milk have incorporated. The mixture won’t come together at first, but, as you continue to cook it, it will dissolve together beautifully. Ladle a little of the hot milk mixture into the egg yolk mixture. Whisk constantly until combined and the eggs have acclimatized to the heat. Pour this mixture back into the saucepan with the remaining milk. Continue to cook, whisking constantly, until the mixture is very thick and leaves a trail, a few more minutes. Remove from the heat and whisk in the salt. Strain the crème patissiere through a fine-mesh sieve and into a medium sized mixing bowl. Immediately cover the surface of it with a thin layer of plastic wrap. Set the bowl in the refrigerator to chill completely, at least six hours or overnight. Just before you’re ready to fill the doughnuts, place the cream into the bowl of a stand mixer fitted with the whisk attachment. Whisk, until medium-firm peaks have formed. Fold half of the whipped cream into the chilled crème patissiere to loosen, then, gently fold in the remainder of the cream. Place the mixture into a large-sized piping bag fitted with a medium-sized round tip then set it in the refrigerator to keep cool until assembly. Place the milk in a small saucepan set over medium-low heat. Heat, stirring often, until it is lukewarm in temperature.Remove the saucepan from the heat and whisk in the yeast until dissolved. Set aside to proof for 5 minutes. Meanwhile, in the bowl of a stand mixer fitted with the dough hook attachment, combine the flour, sugar, and salt, until combined. Pour the milk mixture into the dry flour ingredients. Mix, on medium-low, until a rough and shaggy mixture has formed, about 1 minute. Add in the eggs, one at a time, until well incorporated. Set the mixer speed to medium and let the dough knead for 5 minutes, until a firm and smooth ball has formed around the base of the dough hook. Add in the butter, a tablespoon at a time, until all incorporated. Increase the mixer speed to medium-high and let the dough knead for a further 6 minutes, or until elastic, velvety, and smooth. Place the dough into a large-sized lightly greased bowl and cover it with a layer of plastic wrap. Let it rise in a warm place until doubled in size, about an hour to an hour and a half (depending on the temperature of your kitchen and the climate you’re in). Once risen, knock the dough back to deflate it. At this point, you can choose to re-cover the bowl and set the dough in the refrigerator to chill overnight and make the doughnuts in the morning or proceed with making them now. Turn the brioche dough out and onto a floured surface. Using a lightly floured rolling pin, roll the dough into a rough circle that’s about 2.5 cm (1 inch) in thickness. Using a circular cutter, cut out as many doughnuts as possible from the dough. Re-roll the scraps to the same thickness as before, and repeat. You should get about 15 - 17 doughnuts from the dough. Place them onto a baking tray lined with non-stick parchment paper. Cover loosely with a clean kitchen towel and set aside to proof, for a further 20 minutes. Meanwhile, place the oil into a large heavy-bottomed pot set over medium-low heat. Slowly bring it to 180 c (350 f) in temperature. Put the sugar into a medium sized mixing bowl and place a wire cooling rack over a baking sheet lined with non-stick parchment paper. Once at temperature, fry off the doughnuts. Using a mesh spoon, carefully lower the doughnuts, two to three at a time, into the hot oil. Fry for 1 ½ to 2 minutes on each side, or until inflated and golden brown. Remove from the oil and put the doughnuts onto the cooling rack. Let them sit for a minute then carefully coat each in the sugar. Repeat with the remaining doughnuts, adjusting the heat as necessary to ensure that the oil remains around 180 c (350 f) each time. Once all the doughnuts have been fried, use a sharp knife to cut a small indent into their sides. Remove the crème patissiere from the refrigerator. Pipe the filling into the doughnut hole as much as the doughnut will allow, making sure that a little of the crème patissiere oozes out the top of the hole. Carefully set aside and repeat with the remaining doughnuts. The doughnuts are best eaten warm straight after making.